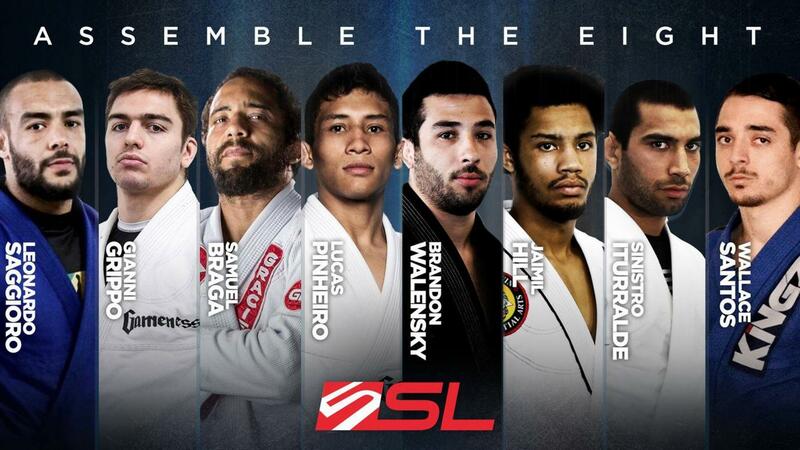 The Five Grappling Super League is back, and this time it has assembled eight outstanding lightweight black belts to take part in a straight knockout tournament on July 15 in San Diego. With seeding decided by random draw just one day before the event, the Super League pits elite black belts against each other in a series of high-octane, fast-paced matches. Leonardo Saggioro (BTT) Gritty and tough, this pressure passer took a silver medal at the recent 2017 IBJJF World Championships. Gianni Grippo (Marcelo Garcia) One of the best-known lightweight competitors in the business, a true technician with a killer berimbolo game. Samuel Braga (Gracie Barra) One of the best Gracie Barra competitors, a black belt with tons of experience and an unpredictable game. Lucas Pinheiro (Alex Martins) A standout Brazilian now based in Texas, Pinheiro is a familiar sight on podiums everywhere. Brandon Walensky (Clark Gracie) One of Clark Gracie’s main training partners and — just like his mentor — owner of a nasty omoplata. Jamil Hill (Lloyd Irvin) One of the breakout stars of 2017, a new black belt with tons of potential after taking bronze at Pans and Worlds. Francisco ‘Sinistro’ Iturralde (Del Mar Jiu-Jitsu) The wily Ecuadorian grappler is unpredictable, aggressive, and always entertaining! Wallace Santos (Soul Fighters) A competitor and coach based in Las Vegas, the Soul Fighters rep has fought big-name opponents on all manner of events. The action doesn’t stop there, with a special submission-only match between Matheus Diniz and Keenan Cornelius also on the event! !